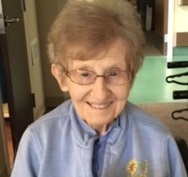 Dominican Sister of Peace Margaret Therese Baranek, OP, (87) died at the Lourdes Senior Community in Oxford, MI, on October 7, 2018. A native of Chicago, IL, she was born in 1931 to Louise Kavac and Joseph Baranek. She entered Dominican Sisters of Oxford, now the Dominican Sisters of Peace, in 1950. One of seven children, Sr. Margaret Therese – or M.T., as she was known by her Dominican Sisters – came from a musical family. That love of music stayed with her for her entire life. A true Dominican, Sr. M.T. also loved to learn and to teach. She attended the College of St. Francis in Joliet, the University of Detroit, and Siena Heights College, where she earned her Bachelor of Science in Biology with minors in chemistry and math. She continued her studies at Marquette University and Webster College in Missouri, earning a Masters of Theology in Religious Studies. Sister Margaret Therese ministered in Wisconsin and Michigan, teaching science, math, religion, and music to students in grades 2-12. For more than 40 years, she delighted in sharing her love of learning, using unique methods like music and puppet shows to pique the interest of her younger students. Sister Margaret Therese also ministered as DRE at Sacred Heart Parish and played the piano for the adult choir. She also enjoyed sharing her talents by volunteering at the Oxford Motherhouse library and as a music minister. Sr. Margaret Therese was preceded in death by her parents; Joseph and Louise Kavec Baranek; sisters Mary Baranek and Ann Nylen, and her brothers Joseph, Louis, and Frank Baranek. She is survived by her sister Theresa Baranek and many nieces and nephews. A Vigil of Remembrance Service was held at the Dominican Sisters of Peace Motherhouse Chapel in Oxford, MI, on Thursday, October 11, 2018. The funeral liturgy was also held at the Dominican Sisters of Peace Motherhouse Oxford Chapel on Friday, October 12, 2018. Sr. Margaret Therese was interred at Our Lady of Sorrows Cemetery, Oxford, MI. Memorial gifts in Sr. Margaret Therese Baranek’s memory may be sent to the Dominican Sisters of Peace, Office of Mission Advancement, 2320 Airport Dr., Columbus, OH, 43219 or submitted securely at oppeace.org. To download a printable copy of this memorial, please click here.